The Baton Rouge Business Report is published bimonthly, 26 times a year. Copies of each issue are available for $2.75 on newsstands across the Greater Baton Rouge area. Special issues such as Annual Report, What’s New in Health Care, Real Estate Report, Giving Guide and our annual Book of Lists are mailed to our subscribers. Click here to find a newsstand location near you. Click here for troubleshooting assistance. What is a Business Report Insider? How much does it cost? Ready to subscribe? Check out our current offers here. I’ve been a longtime subscriber to the magazine, but now I can’t access some content on the website. How can I get access now? Only paid subscribers to the Business Report qualify for Insider access. Insiders are given unlimited digital access to all content on the site including the news archives and data center. 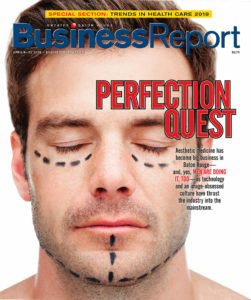 If you are a paid subscriber, please visit businessreport.com/setup to activate your INSIDER access. I receive a complimentary subscription of Business Report mailed to my office. Does this include digital INSIDER access? No. Our complimentary subscriptions do not include INSIDER access. 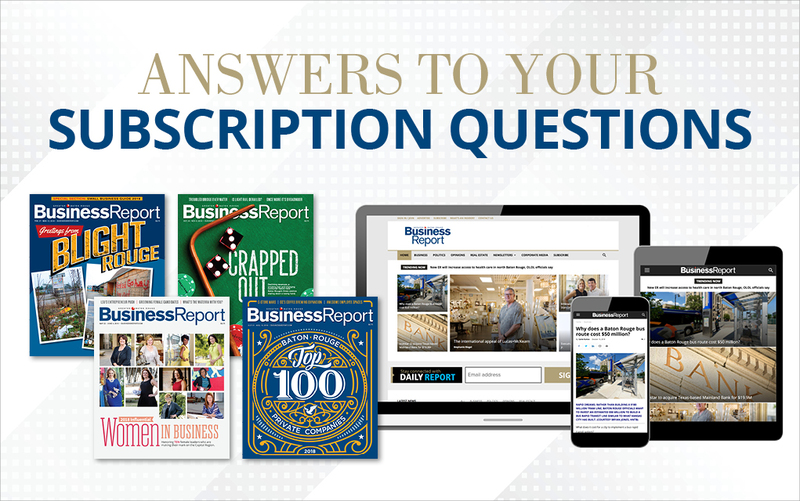 If you would like to pay to receive INSIDER access, please visit businessreport.com/subscribe or call Customer service at 1-866-991-5479. Can I read any content on BusinessReport.com for free? All complimentary subscriber and nonsubscriber visitors will have access to two online articles behind our paywall per month, with additional free content also available. All Daily Report AM, Daily Report PM and Daily Report News Alert content remains free as well. What articles count against my monthly limit? All premium content will be marked with an INSIDER tag. If I click on an article I’ve already read does it count against my monthly limit? No. You may revisit any article you’ve already read within the current month. Can I still read Daily Report for free? Yes! Daily Report will still still be delivered twice a day to your inbox for free, as will any news alerts we deploy. I have a subscription, but my login credentials aren’t working. How can I get help? If you are a paid subscriber who has not yet setup Insider access, you may do so here: businessreport.com/setup. If you have forgotten your password, click here to recover it. An email will be sent with instructions to reset your password. If you need further assistance, please call Customer Service at 1-866-991-5479. I know my existing password but I want to change it. What do I do? I am not receiving my subscription. What should I do? If you are not receiving your print subscription, call Customer service at 1-866-991-5479. If you are not receiving your enewsletters, you may need to whitelist our domains. Here’s how. You may change or cancel your subscription at any time. To change or cancel your subscription, please contact Customer Service at 1-866-991-5479. We do not accept cancellations by mail, email, or by any other means. If you cancel your annual subscription, your subscription and other subscriber benefits will end immediately upon your cancellation and you will receive a refund prorated to the effective date of your cancellation. If you cancel within the final 30 days of your subscription, the cancellation will not take effect until the end of your current billing period. You will not receive a refund; however your subscription access and/or delivery and accompanying subscriber benefits will continue for the remainder of the current billing period. All of our subscriptions are on automatic renewal for your convenience. You do not have to worry about mailing back renewal notices or missing issues if you forget to renew. You have complete control over your subscription and can contact us to change or cancel at any time. Your subscription will renew automatically at the rate in effect at the time of your renewal unless you notify us seven days prior to your expiration date. You will receive an email notification from businessreport.com when your subscription is due to expire. The subscription fee will be billed automatically to your credit card and you can cancel at any time. If you have additional circulation questions, call  928-1700 or email circulation@businessreport.com.